Glass Half Full: #MealPlanningMonday - w/c 15th April I need help this week! #MealPlanningMonday - w/c 15th April I need help this week! Another week has flown by, we're in the middle of April already. Can't quite believe it. Although the weather is a little warmer, its still very wet down here, so my weekly menu's haven't changed very much. Still hearty comfort food. However the next morning, stuck with it and had a slimming world friendly cooked breakfast of bacon, mushrooms, tomatoes and poached eggs, which saw me through the day and getting back to a chocolate and goody free house. The Sweet Onion and Lentil Stew from Nigel Slater from last weeks menu, was delicious. I made it without the oil and butter and used trimmed smoked bacon. I believe this made it syn free, without compromising on the taste. One I'd recommend! However, for my taste buds (which are slightly screwed from the chemo) I'll use more paprika to give it a bit of kick. What do you think? I'm away this week for two nights again and really need to keep motivated and make healthy choices. Any tips???? 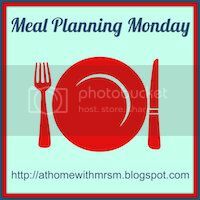 Don't forget to check out Mrs M's Meal Planning Monday linky, for other meal planners especially of you're stuck on what to have on yours! to five different cities worldwide at a go.